I think often about that line from today’s Gospel reading, taken from the Gospel of St. Matthew. It’s the conclusion of our Lord’s sermon on the Beatitudes. 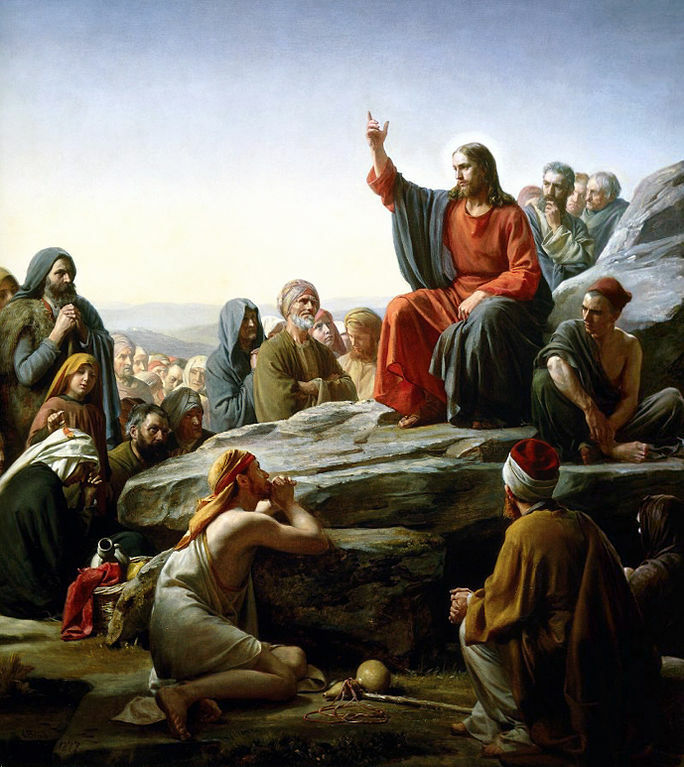 The Beatitudes are a tall order, considering our human weakness. And yet Jesus encourages us to live them because he knows that, if we do so (to the best of our ability), we will one day join him in Eternity. I do better and worse at living the Beatitudes, depending on what’s going on in my life at the moment, Sometimes I have a difficult time being merciful, especially in the face of injustice. I’m not always the best peacemaker, particularly when there’s drama involved, I’m fatigued, and I just want to wash my hands of the whole mess. I’m not so sure I ever like to be persecuted. Right now, it’s the meekness I’m struggling with. By meekness, I mean being so humble of heart that I accept God’s will without question. Or, by questioning it and coming to the realization that God knows better than I do. (Remember our Blessed Mother at the Annunciation? “How can this be, since I have no relations with a man?” [Lk 1:34]) By meekness I mean putting aside my own selfish needs and goals and looking only to our Lord. By meekness, I mean carrying my cross with a joyful smile and trusting that there’s a reason I must carry it. You see, meekness is not only a Beatitude; it’s a be attitude. I’m not totally there yet, but I’m working on it. Today, I head back to the Mayo Clinic where I’ll undergo two procedures on my cervical spine. The docs there are hoping that this will allay the need for surgery. I’m hoping so, too. What a part of me is hoping for as well is that this whole thing hadn’t unfolded in the first place. According to my own reckoning, I would do quite well to just go on with my life and not have to deal with a spine condition, thankyouverymuch. Ah, meekness. You allude me! But here’s the thing. I forget about grace. The old adage that God never sends a cross to bear without also giving the grace to bear it is as true as it ever has been. Our Lord was not speaking only to the Apostles, and he was not referring only to Pentecost. He was speaking to all of us for all time. Meekness is what keeps us from feeling like orphans. it’s what helps us to put ourselves aside, and look to our Lord. It’s what makes us scrap our own disjointed plans and let the heavenly Father take the lead. Meekness helps us to weather even the most difficult of storms and what channels for us the grace to #LiveHoly, as I wrote in my blog post for National Catholic Register. I’m praying for the grace of meekness. #LiveBoldly, #LiveHoly, Beatitudes, Faith. Bookmark.